The Consequences of Financial Stress for Individuals, Families, and Society | Doyle Salewski Inc.
People in financial trouble often view their situation as catastrophic. They can suffer from serious debt stress which may result in health and/or relationship problems, depression, and even suicide. At Doyle Salewski’s request, Carleton University composed a survey designed to measure our clients’ stress levels and ability to cope both before and after meeting with us. The survey showed that 90 percent of our clients averaged a 50 percent decrease in stress levels after meeting with us. 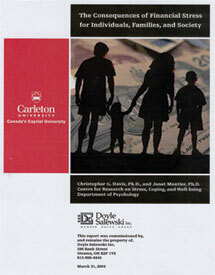 Download the Carleton University Report (PDF).